Since JACK manages the audio connections for any application that uses it, JACK can be used to connect the output of one application to the input of another. In this chapter, we will connect the output of Pure Data Extended (a FLOSS multimedia application) to an input of Ardour. For this example, open Pure Data Extended from the Applications menu (Applications > Pd-extended). Then tell Pure Data Extended to use the JACK audio system by clicking Media > jack. And finally, within Pure Data Extended open a simple patch emitting a test tone with Media > Test Audio and MIDI. Clicking the small box marked "-20" under the TEST SIGNAL text produces a test tone we can route to Ardour. First create a new Track in Ardour called From Pure Data, and arm it to record. Now, using the JACK Pilot Connections Manager (or the Connections menu of Qjackctl), look for the outputs of Pure Data Extended, found here as "output0" and "output1" under "pure_data_0". 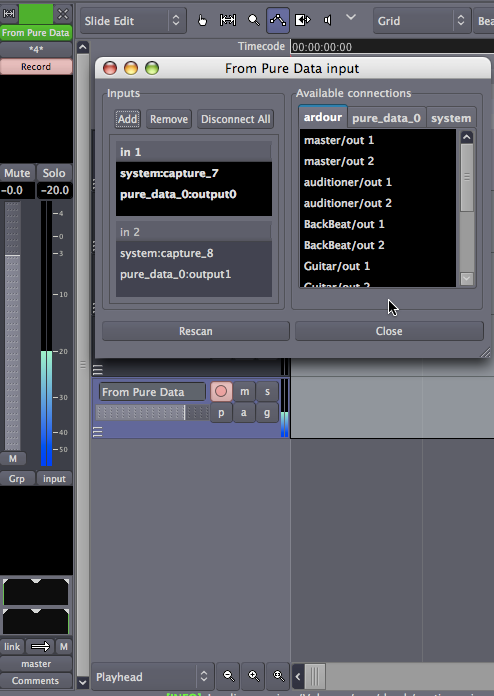 By selecting an output and clicking on one of the inputs labeled "From Pure Data/in", the audio output of Pure Data Extended is connected to an audio input of Ardour. 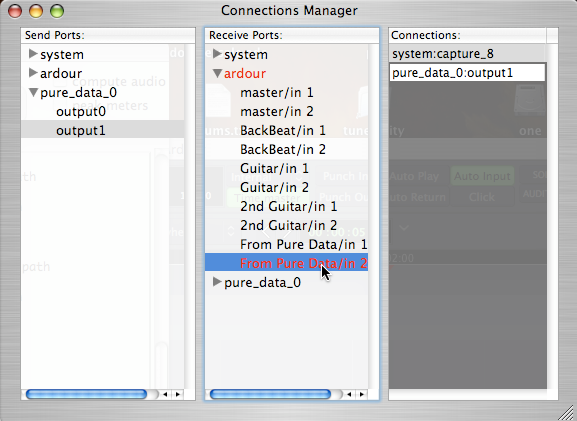 The input Routing menu in the Ardour Editor Mixer Strip can also be used to make the connection, as shown here. Since the track is armed to record, we see the Levels of the signal being sent to Ardour from Pure Data Extended in the Editor Mixer. From here, follow the normal procedure to record the signal. This concludes the section on Starting Sessions. Now that you have some audio Imported, recorded from a line or microphone input or even from another JACK application, proceed to the Editing Sessions section and learn how to arrange your composition.